Isn’t it great when something works so well you don’t even question it! Well, that’s what I thought after driving Audi’s first all-electric model, the E-Tron, on UK roads. Why? Well, apart from the electric power, the E-Tron feels every bit the proper ‘Audi’ model from the driver’s seat. So think quality, mixed with state-of-the-art technology, and you won’t go far wrong. It seems like a good time to launch a halo EV model too, with double-tonne range seeming to be the tipping point for acceptance, plus the success of rival models, such as the 2019 Car Of The Year, the Jaguar I-Pace. Personally, I think the biggest disappointment of this car is the way it looks. 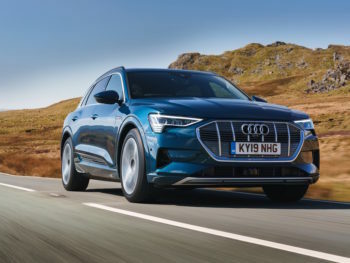 Considering the forward-looking technology, apart from the unique front grille, headlights with their distinctive light signature and aero-style alloy wheel designs, this could be any other Audi SUV. The only futuristic highlight on the outside of the E-Tron, are the optional £1,250 Virtual Door Mirrors. These basically replace the standard door mirrors, with a pair of rear-facing cameras. The feed from the cameras is then sent to two small screens, at the corners of either end of the dashboard. Having tried them, despite making the car more slippery, which equals more range, I’m not convinced sadly. Why? Well, the screens are mounted lower than you’d expect, the adjustment is a bit fiddly and then there’s the price, as you need to order them with Audi Side Assist, and that’s priced at an extra £625! Inside, the E-Tron feels spacious and well-equipped, as you’d expect for a car with a basic list price of £71,520. The three screens in the dashboard (one for the Audi Virtual Cockpit’s instruments, the other two for the infotainment system and MMI Navigation Plus system) add to the futuristic feel of this car. Plus, the 600-litre boot, which can be extended to a massive 1,725 litres. A 95kWh battery mounted beneath the E-Tron’s seats powers the two electric motors, equalling 402bhp with power boost. Power boost enables the driver to enjoy the full power for short bursts, of up to eight seconds. Having tried it, I can believe the 5.7 second 0-62mph acceleration – the way this two-tonne SUV eats tarmac is jaw dropping. Despite this performance, having driven a mixed 120 mile launch route, I think the 241 mile combined WLTP range is entirely achievable. 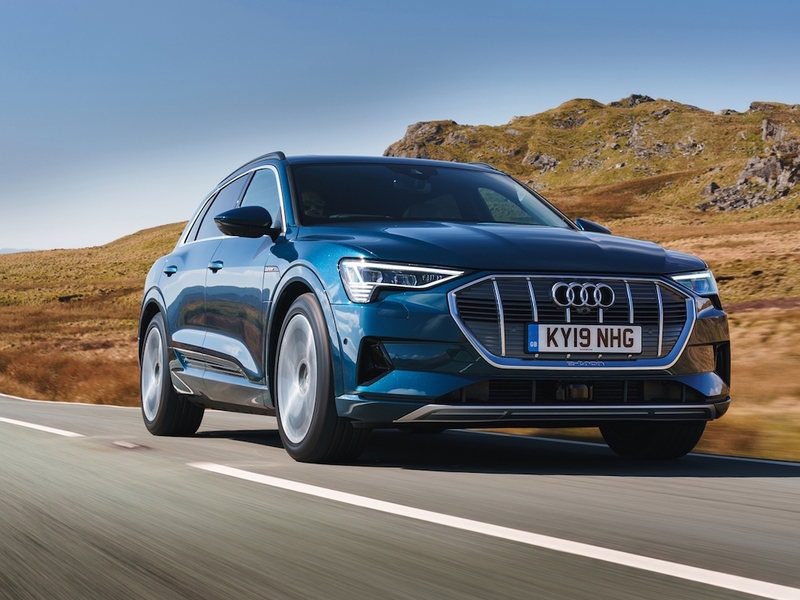 Expect 80% charge from a 50kW CCS DC charge unit, in 90-120 minutes, but the E-Tron can also use next-generation 150kW chargers that are due next year, equalling 80% charge in just 30 minutes. The power flaps for the two charging sockets, located ahead of the front doors, are neat too. Standard 20-inch alloy wheels, air suspension and no engine noise equal a comfy and refined ride, which firms up nicely in Dynamic mode – although it’s not really sporty, in spite of the performance. The steering is reasonably precise and considering its SUV height, the low centre of gravity means body roll is kept well under control. The Verdict: Yes it’s expensive, but the E-Tron is also one of the most complete and competent EVs on-sale. If you’re considering a Tesla, make sure you give this a look too.